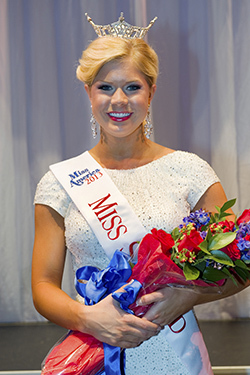 Lauren Hunt, a sophomore journalism and mass communication/public administration double major from Dothan, Ala., was crowned Miss Samford University 2013 Friday, Oct. 19. Hunt, age 19, will represent Samford in the Miss Alabama scholarship pageant in June. Her pageant platform is Swim Safe and the American Red Cross. Hunt, daughter of Lisa and Lewis Hunt, also won the swimsuit competition. Finalists were Ellen Hardy, a junior theatre major from Anniston, Ala., first runner-up; and Katy Flinn, a junior journalism and mass communication major from Carrollton, Ga., second runner-up. Flinn also received the Spirit of Samford award. Catherine Thompson, a junior psychology major from Huntsville, Ala., won the talent competition for her vocal performance of "Think of Me" by Andrew Lloyd Webber.